Couple of months ago, I had the privilege and opportunity as Penny Black designer to make a card for one of sketches from July Cardmaps by Becky Fleck. Becky makes sketches for both cards and scrapbook layouts. She calls them Maps – Cardmaps and Pagemaps. During my scrapbooking days, I have used several of Becky’s Pagemaps for my layouts. And also had an opportunity to make a card for one of her Cardmaps ages ago. I love sketches as many of you already know. So I was excited to make a card using this sketch from Becky. 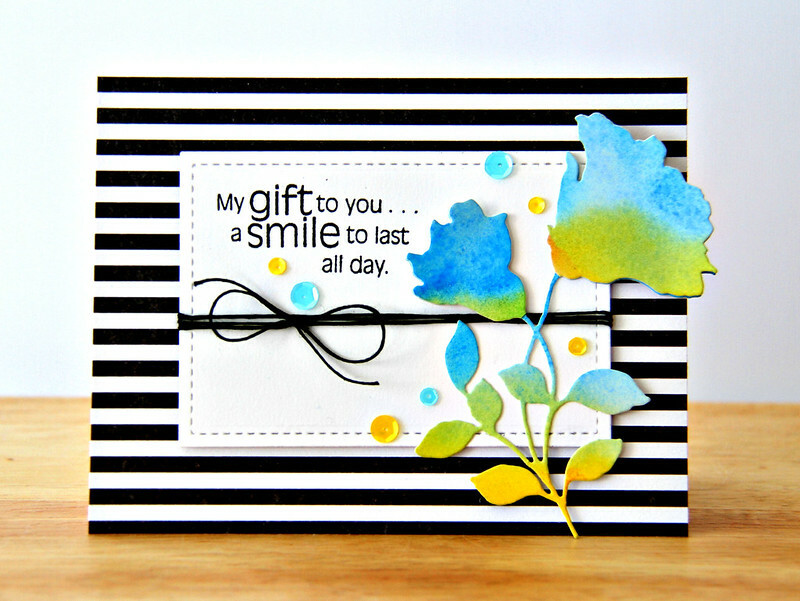 Products I have used are from Penny Black – Glamorous die, Beau Jardins paper pad and Smile All Day stamp set. The white panel is die cut using Pretty Pink Posh Stitched Duo 2 die set and the sequins are also from Pretty Pink Posh. I have used Lemon Drops and Aquamarine 6mm and 4mm sequins. The die cut is watercolour using Gansai Tambi watercolour. Versatile sketch. Stamp and make your own background for the sketch. Use different die cuts as you focal point. So play with the sketch and make your own custom card. There are more sketches for you to use HERE. Wow!! So pretty!! Love black stripes!! Love the watercolouring Gayatri with the bold stripes behind.